(AINA) -- Christians Copts in the area of Embaba were attacked Saturday evening by Muslim Salafis. The attacks lasted for 14 hours. 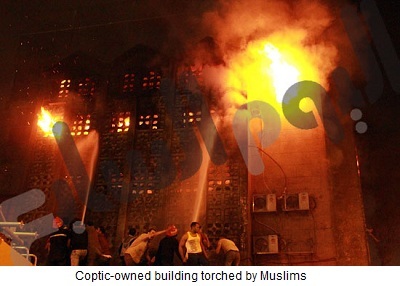 The Muslims fired guns and rifles and hurled Molotov cocktails at Coptic churches, houses and businesses. 12 Copts were killed and 232 wounded. 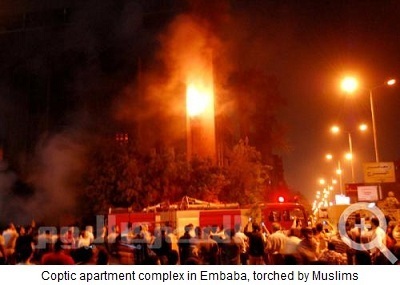 An apartment complex inhabited by Copts, near St. Mina Church, was set on fire after being looted. Another two houses were torched (video). Youssef Edward, a deacon at St. Mina Church, said the army and security forces stood watching while Muslims threw Molotov cocktail at homes. He said the Muslims who attacked the church came from outside, as Muslims from the area live peacefully with them. "The army was not able to control the situation, and the mob was chanting 'Islamic', 'Islamic'" (video showing wounded Copts and a dead Copt named Medhat in St. Mina). 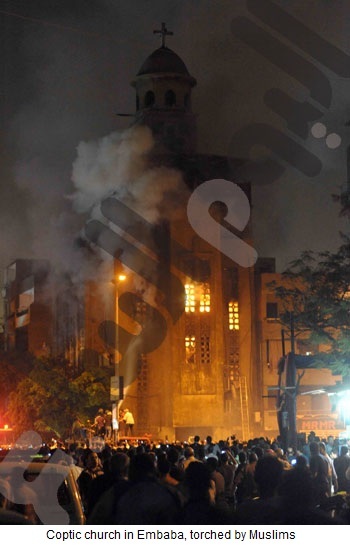 As soon as Copts heard of the Salafi attacks, they rushed to protect their churches. There were contradictory reports of Copts using guns to defend themselves. Witnesses reported the Salafis were wearing Taliban style clothes. "I believe they are of the 3000 Jihadis who returned lately from Afghanistan," Saber Loutfi, one of the Embaba residents told Coptic Free Voice. Renowned Muslim liberal writer Nabil Sharaf el Din said on the Coptic Hope Sat Channel "The army is either incapable or is an accomplice to the Salafis." He believes that what took place today exceeds anything else that had previously happened to the Copts. "If the army does not takes a stern position with the Salafis they will look real bad." He said that all moderate Muslims and Copts should stick together to overcome the Salafis. In his opinion the Salafis, who were encouraged and nurtured by the old State Security, are like the genie who has come out of the lamp and now cannot be restrained or controlled. The Bishop of Giza, Anba Theodosius, said "These things are planned. We have no law or security, we are in a jungle. We are in a state of chaos. One rumor burns the whole area. Everyday we have a catastrophe." Addressing the Salafis he said "We will never leave our country". Most witnesses interviewed asked for international protection of the Copts, as the army does nothing when it comes to attacks on Copts. Others accused the army of complicity. Camelia Shehata, who the Muslims claim had converted to Islam and was held by the church against her will, appeared today on Hayat Christian TV and said Muslim claims are groundless and that she is 100% Christian. She denied that she had met any of the Salafi sheikhs who claimed they went with her to Al-Azhar to convert to Islam. A large number of Copts are presently staging a sit-in in front of the US Embassy in Cairo, asking for International Protection for the Copts. 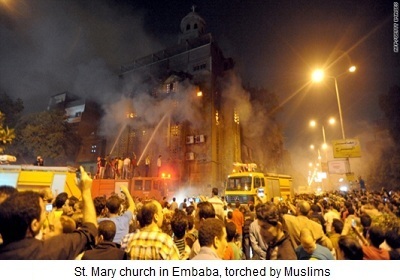 Coptic groups have called for a "million-man" protest in Cairo and Alexandria on Sunday to protest the Embaba attacks. The march will start at the High Court and end in Maspero, in front of the State TV Building. The funeral of the Coptic victims will take place on Sunday at St. George's Church in Giza.